Set Up: Hi/Lo track, siding attachment, two extra pair of tracks. Operation: Jeff and his helper(s) usually go milling once a week for 5 to 6 hours, but they have done 14 8-hour days straight cutting 8×8 beams. 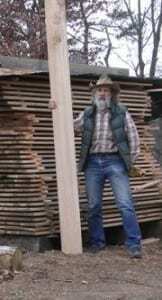 Jeff often gets news of available logs through the grapevine, he is known in the area for being able to saw at the owners property and trade their labor for lumber, cash or almost anything. Most of their milling jobs get about 3000 to 5000bf of lumber but on one occasion they got 15,000bf. 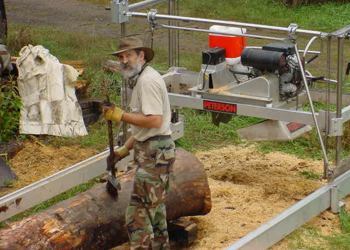 Best feature: There are two great joys working with a Peterson Portable Sawmill; one being the steady exercise operating the mill and the other being the beauty and utility of the product. Tips: Watch for metal in any log taken from near a house or outbuilding, keep your safety gear in good condition and always wear it in the correct way. Never force your mill to do something it’s telling you it doesn’t want to do. Keep your blades sharp and wet, perform all the preventative maintenance recommended in the owner’s manual. Oh and saw as often as you can! Motto: Trees are an infinite source of construction materials if the forest is treated with respect. Cut and saw gently, and do it forever. Jeff and his mates were hollowing out some logs for a customer. 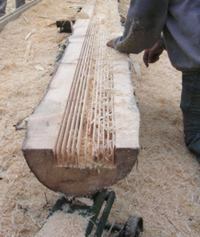 They milled them in half and cut the centers out then finished them of with large chisels. 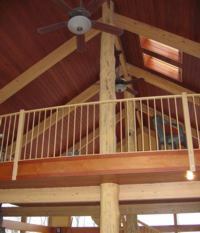 The hollowed out logs were used in the customer’s house to surround the l-beams that were holding up the 25 ft ceiling. Jeff is setting up a poplar log ready for milling, He’s brushing it off with a railroad track broom normally used to sweep snow and ice from railroad switches but perfect for working on logs.